Britain's top policeman is being urged to explain why he secretly taped a phone call with the attorney general. Metropolitan police chief Sir Ian Blair recorded the conversation with Lord Goldsmith last September without him knowing, it has emerged. Lord Goldsmith is said to be "rather cross" and "somewhat disappointed". Richard Barnes, a Conservative member of the Metropolitan Police Authority and the London Assembly, called for Sir Ian to consider his position. "He must clearly discuss this with the chairman of the police authority, and no doubt the home secretary will want to talk to him," he said. "But I think he has got to a stage where he must consider his own position. The reputation of the Metropolitan Police really must be paramount and that is what we must protect." Mr Barnes told BBC Radio 4's Today programme he was "utterly surprised and shocked" by Sir Ian's actions. Even before Sir Ian's secret taping of the attorney general emerged, the Home Office had reportedly told him to stay out of the limelight - or risk losing Downing Street's support. But the Home Office Minister, Hazel Blears, has denied she gave him "any instructions, or indeed advice, in those terms". "That would be entirely inappropriate for me to do that. "This is a very serious issue," Ms Blears added. "Obviously the matter will be taken seriously by the Metropolitan Police Authority." The director of civil rights group Liberty, Shami Chakrabarti, called for Sir Ian's resignation and branded his actions "bizarre". She said: "His behaviour appears to be unconstitutional, unethical, quite possibly unlawful. "This is covert surveillance. It is very hard for any of us to have trust in him as the senior law enforcer... in this country. "He has some serious explaining to do," she said. The call to the attorney general - the chief legal adviser to the government - was about the admissibility of wire tap evidence in court, but it did not concern a particular case. Sir Ian, who is thought to be on holiday, has been criticised previously for his handling of the aftermath of the shooting of Brazilian Jean Charles de Menezes by anti-terror police at Stockwell Tube station last July. Remarks he made about the Soham murders also generated a furore in the media. 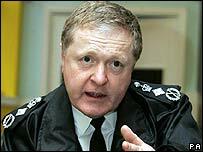 Sir Ian has also admitted taping calls with senior officials from the Independent Police Complaints Commission. An IPCC spokesman said the taped conversations came to light as part of its inquiry into the aftermath of the shooting. "We understand three telephone conversations between senior IPCC personnel and the commissioner of the Metropolitan Police have been recorded without our prior consent," said the spokesman. "One of these conversations was between our chair Nick Hardwick and the commissioner. "We are surprised about the recording of calls and now have the recordings. We are dealing with this issue." The spokesman added that no formal investigation into the allegations was taking place. The recording and monitoring of telephone calls is governed by a number of different pieces of UK legislation, according to Ofcom, the telephone industry regulator. It is not illegal for individuals to tape conversations providing the recording is for their own use, under the Regulation of Investigatory Powers Act 2000 (RIPA). It is a civil, not criminal, matter if a conversation or e-mail has been recorded and shared unlawfully. If a person intends to make the conversation available to a third party, they must first obtain the consent of the person being recorded. What's bugging ministers about phone taps?